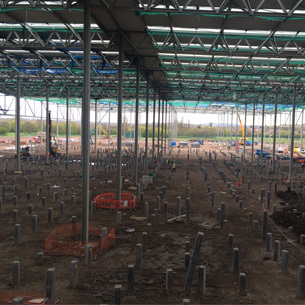 GWP Architecture are providing architectural services to TSL Projects on the construction of the new 41800m2 / 450,000sq ft BREEAM ‘Excellent’ Lidl Regional Distribution Centre at Wednesbury, alongside Junction 9 of the M6. The first milestone has been reached on site, with the completion of the steel frame to the central space. Construction of the building – which measures the equivalent of six professional football pitches – was granted planning permission in 2015 and started on site in December 2015. This centre is a key part of Lidl’s continuing expansion across the country and will create circa 500 jobs to operate the centre on a three-shift basis, seven days a week, 365 days a year. Head to the project page for more information.